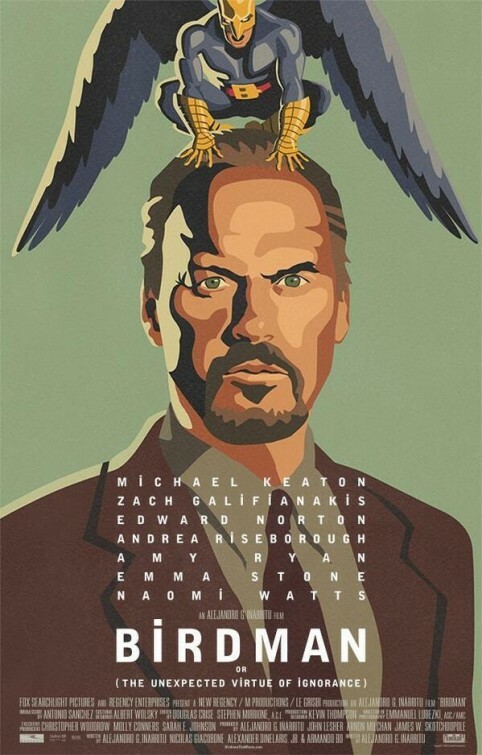 Riggan Thompson (Michael Keaton), a washed-up actor who hit it big as the superhero “Birdman” in a popular and lucrative franchise, tries to reinvent himself both as an artist and as a man with an adaptation of Raymond Carver’s short story "What We Talk about When We Talk about Love". Given the height of the stakes, every perturbation – and there will be aplenty – rattles his frail psyche, prompting crippling self-doubts accompanied by violent tantrums and awakening the injured pride of his redoubtable ego, the superhero Birdman. Films like Birdman, so rich, intoxicating and yet stingingly funny, are no longer getting made today. This is why Iñàrritu’s latest effort is a rarity in the modern cinematic landscape, like a baroque and bizarre gem in the midst of a dreary prairie. In comparison, most of other mainstream endeavors feel bland and tasteless. It has enough visual élan to eclipse effortlessly Iñàrritu’s previous work, even the gritty Amores Perros, and an infectious, aggressive soundtrack that imparts a sense of continuous emotional panic and tension. This craving for cinematic bravura oscillates between a dissonant but enthralling theatricality and a heightened sense of time and place that gives Broadway an almost mythical, surreal dimension: Riggan and his crew tread narrow corridors, crammed foyers and stuffed cabins like the entrails of a gigantic monster. But leaving its distinct visual sensibility aside, Birdman is also a brutally honest and uncompromising story, brilliantly performed and wittily scripted. It embraces its ambiguity but it’s never confusing or messy. Reminiscent in its acid tone of Who’s afraid of Virginia Woolf or, better yet, Tennessee Williams, Birdman can be read as both a biting satire with supernatural accents and a disturbing tale of alienation and our insatiable thirst for love and acknowledgment. Either way, it’s a great moment of cinema and a strong contender for best film of the year, that proves that the Mexican director has only heigtened with the passing of time his sense for beautiful mayhem and ear for the anarchic. And most importantly, he has never been so humane and compassionate.